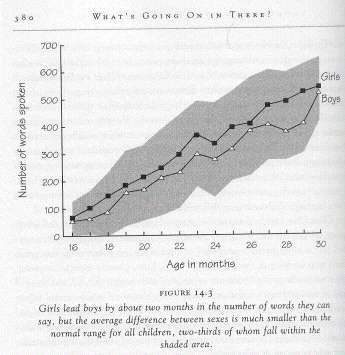 What do these trajectories look like and are there any gender issues that may help explain why boys are struggling today? Most children say their first few words at around 12 months of age. It is an exciting time, as it is soon followed with more words, and then an exponential growth in vocabulary. However, the pace of development differs among children, and depends on their environment. Huttenlocher et al. 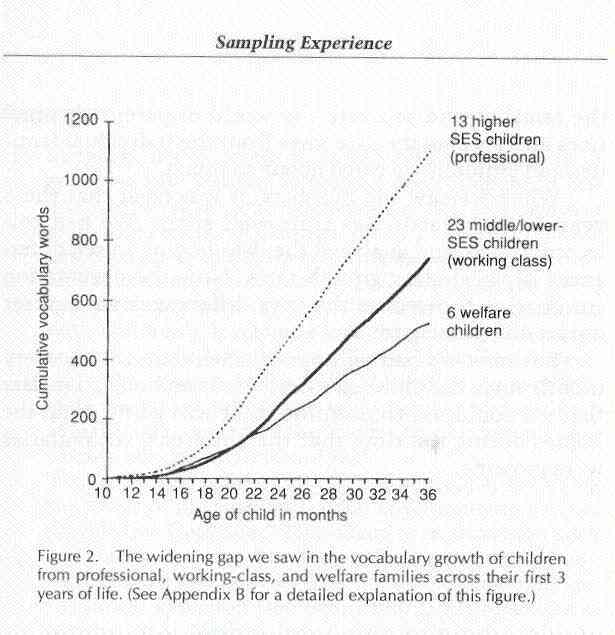 (1998) conducted detailed studies of children’s vocabulary development from 12 to 26 months of age. Their work demonstrates the importance of understanding children’s growth trajectories. 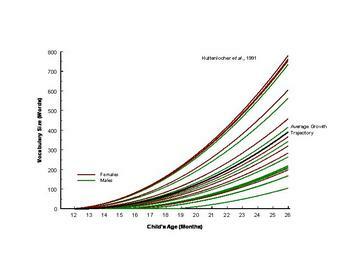 Figure 2 displays the trajectories for 26 of the children they observed. 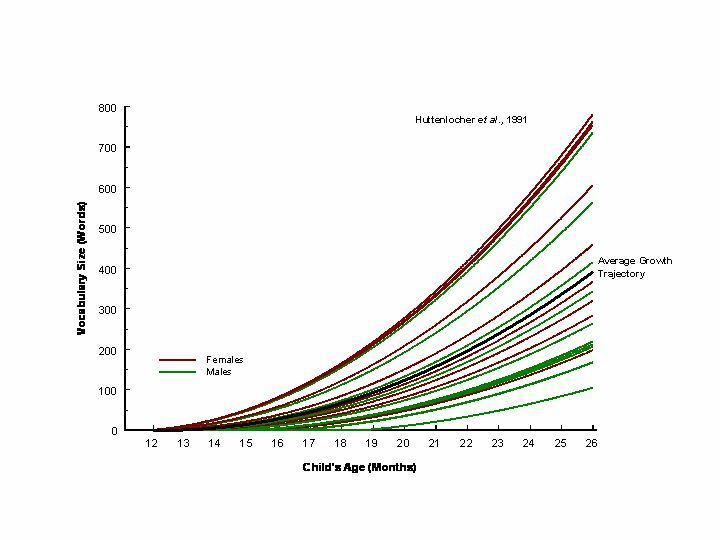 The solid black line represents the average growth trajectory, while the red and green lines depict the trajectories for girls and boys respectively. A multilevel analysis of these data revealed that these children varied significantly in their rates of vocabulary growth, and that about 20% of this variation was associated with the quantity of mothers’ speech. 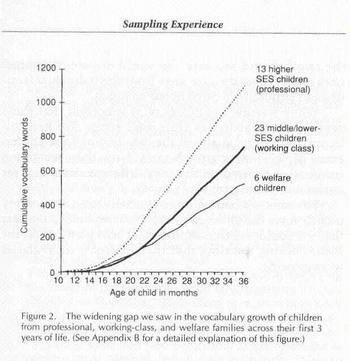 Also, the frequency with which mothers used particular words was strongly related to the age at which children acquired those words. This research and similar work by Hart and Risley (1995) provide strong evidence of the importance of both the quantity and quality of parental speech. The next slide comes directly from Hart and Risley's work and confirms the data that Wilms was looking at. "We conclude that these variables are not simply marker variables denoting social class or subculture but are powerful characteristics of everyday parenting that cause important outcomes in children....everyday parenting in the individual family was predictive of the accomplishments of the child>"
Reading is apparently the best! Just wanted to let you know, Rob...I've thought of this research hundreds of times over the past three years. Your timing couldn't have been better for me, with a two-year-old at the time and a new one on the way. Tannis and I aren't big talkers -- our natural tendency would be toward enjoying quiet. But this stuff made me think about how important it was to talk with our girls. I used reading out loud as a fallback in some ways, because it was easier than thinking up something to talk about all the time.